Thursday, December 17th, 2015 at 11:55am. Just because we live in sunny, South Florida doesn’t mean you can’t enjoy a snowy holiday! Every night, City Place in West Palm Beach turns into a winter wonderland with a beautiful snowfall. This has been a beautiful tradition put on by City Place for years and it sure draws a crowd. Each Monday, Tuesday and Wednesday evening at 6 pm and 7pm the snow will begin cascading down onto the plaza. 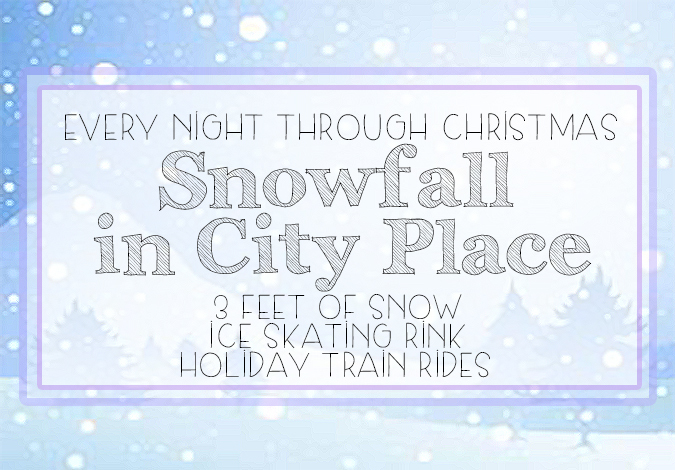 Every Thursday, Friday, Saturday and Sunday the snowfall will take place at 6pm, 7pm and 8pm. Almost 3 feet of snow floats down at each hourly snowfall, which is, even more snowfall than what falls on Central Park in New York. City Place uses a special MagicSnow™ technology that creates incredibly real snow, never producing two identical snowflakes.